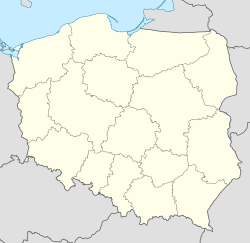 She caayr ayns Queiggey Pomorze ayns twoaie yn Pholynn eh Słupsk (focklit magh myr [swupsk]; Germaanish: Stolp; Kashoobish: Stôłpsk ny Słëpsk; Ladjyn: Stolpa). Roish 1 Jerrey Geuree 1999 by phreeu-valley er Queiggey Słupsk eh roish hie yn queiggey shen er ny scryssey. T'eh soit 'syn ard shenndeeagh Pomorze. Ta'n chaayr ny soie ayns sheear hwoaie yn çheer, 18 km (11 mi) veih'n Vooir Valtagh er yn awin Słupia. She preeu-valley Choontae Słupsk t'ayn, ga nagh vel eh ny chooid jeh'n choontae shen (ta staydys coontae er lheh echey). 'Sy vlein 2010 va 96,655 deiney cummal ayn as t'eh coodaghey 43.15 kilomeaderyn kerrinagh. Rere shen, t'eh coontit myr fer jeh caayryn smoo gloo-chummaltit 'sy çheer. Ta tooilley coadanyn mychione Słupsk ry-gheddyn ayns Wikimedia Commons. Hie yn duillag shoh er ny reaghey er 12 Averil 2015, ec 14:36.